We enjoyed the loveliest appetizer at a local pizzeria just outside of Madison, in Sun Prairie to be exact. I was so pleasantly surprised at what this place was doing with fresh, local ingredients. This is my re-creation of their strawberry, pea and goat cheese starter; I’m missing the fresh peas, but it’s really pretty yummy without them. The strawberries soften just a bit and then melt in your mouth while the black pepper adds touch of earthy spice. 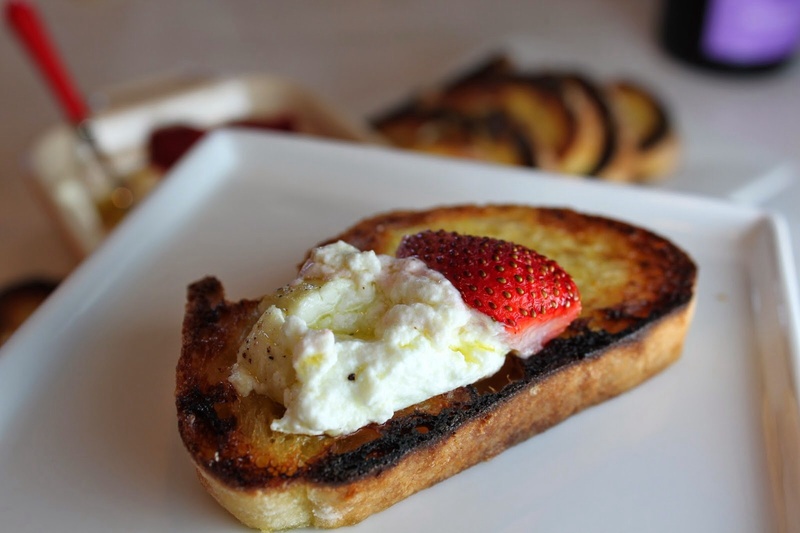 Don’t be afraid of how lemony the crostini is; once you add a little goat cheese and a roasted strawberry you will taste the heavenly flavor combination. There wasn’t a lick left when were done with this. This is a loose recipe, don’t over think the amounts; they are there just for guidance. Preheat the oven to 400 degrees. 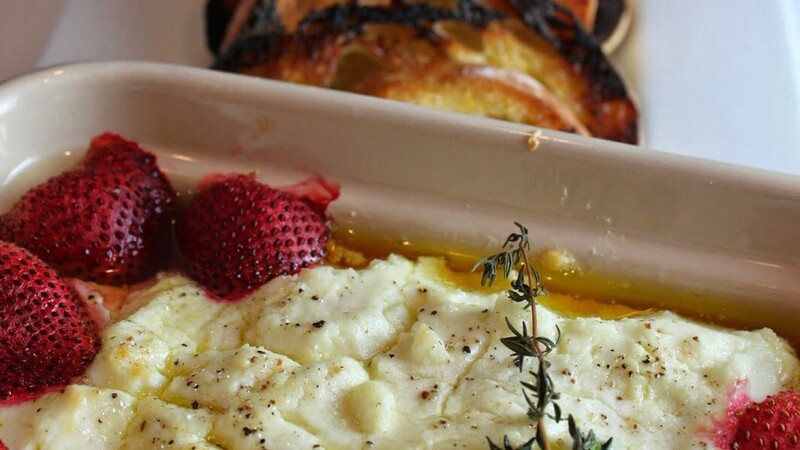 Place the goat cheese in an oven proof dish, one that is just a bit bigger than the amount of cheese. Add fresh strawberries, a drizzle of olive oil and the fresh thyme sprig. Grind a little black pepper over the top, just about 2 or 3 turns of the grinder. Place the dish in the oven and let roast. In the meantime, cut slices of bread. Zest and juice the lemon, mix with the remaining olive oil. Use a brush, brush the mixture onto the bread slices. Turn the oven to broil, place the bread slices under the broiler until toasty. Remove the toast and the cheese from the oven. Serve while warm. Fat and Happy Tips and Techniques: Strawberries are always #1 on the Dirty Dozen (the dirtiest fruit); this is the time to spend the money on organic.